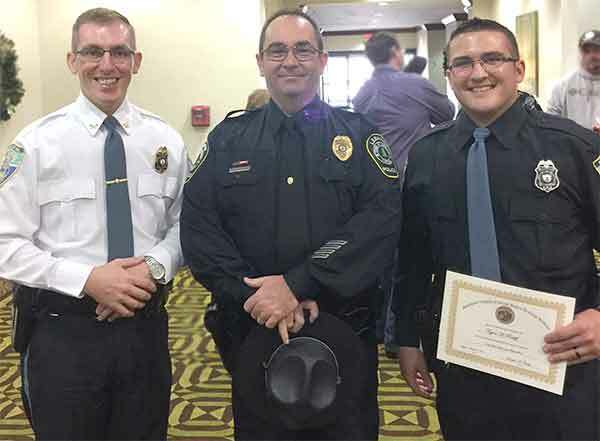 Pictured (center) Jerry Stinson, Chief Brandon Cassell (left), and Taylor Ratliff (right), who graduated from the SWCC Administration of Justice program in December, as well as completing the police academy. Chief Cassell and Officer Ratliff serve in the Honaker Police Department. Jerry Stinson’s most vivid memory about his former career as a police officer on both the Lebanon Police Department and the Russell County Sheriff’s Department doesn’t involve enforcing the law, but saving a life. That story began on a cold morning, one where a hard frost covered the earth. The frozen ice crystals glittered like icy diamonds on the sidewalks and roads. This picturesque landscape would prove to be treacherous to an unsuspecting elderly man who had set out from his house before daybreak to check his mailbox. Stinson, who is now the Program Director for the Administration of Justice (ADJ) Programs at Southwest Virginia Community College, was going about his regular rounds that morning. “I was at the Lebanon Police Department at that time, working as a policeman. I had the early morning patrol,” he said. “While driving, I looked over and saw a human form lying next to the road.” He immediately stopped his car. He saw then that it was an elderly man. In the bitter cold of that winter morning, Stinson knew that he couldn’t delay in providing assistance. “I talked with the man, who had slipped and fallen onto the hard pavement of the sidewalk, he had been there for a short period of time, but he was not in good shape. I picked him up and carried him back to his house,” said Stinson. He then called for the rescue squad. At first, the injured man refused treatment, but after being encouraged to do so by his family, he went to the hospital. They found that the man’s injuries were very severe. If Stinson had not found him when he did and the man had not received appropriate treatment, the outcome could have been much more severe. “The man’s son thanked me in a letter to the town council. It was unexpected and I sincerely appreciated him taking his time to write such a message. However, it wasn’t expected, I was doing my job,” said Stinson. The police officer received a commendation for lifesaving for his quick action in assisting the man. He also received the undying gratitude of a family that knew the value of Stinson’s service to their loved one and to the community. Stinson is deeply committed to the safety and well-being of his immediate community and of the region. In addition to leading the three administration of justice programs at SWCC: Administration of Justice, Associate of Applied Science degree; Law Enforcement, Certificate; and Crime Scene Technology, Career Studies Certificate, he is involved in training for a number of southwest Virginia Law Enforcement Agencies. “I am a sworn officer for both the Tazewell County Sherriff’s Department and the Lebanon Police Department, in addition to the SWCC Campus Police. If and when I am needed, I can be called in to serve,” Stinson said. Over the SWCC 2017 spring break in March, Stinson volunteered for a week at the Tazewell County Sheriff’s Department. He has a high regard for all of the Police Chiefs and Sheriffs he has served with, including Tazewell County Sheriff Brian Hieatt. “My students in the ADJ programs at SWCC serve as interns in several police departments in the area, including the Lebanon Police Department and the Tazewell County Police Department. The Tazewell County Sheriff’s Department takes up to eight interns a semester,” said Stinson, pointing out the reciprocal relationship between the college and local law enforcement. The internships provide an opportunity for SWCC students to work with professionals in the field prior to seeking further education or positions in law enforcement. 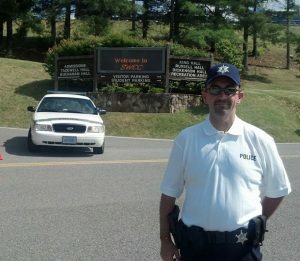 Pictured is Jerry Stinson serving on the Southwest Virginia Community College traffic detail. His commitment to training local law enforcement officers extends to teaching at the police academy in Bristol. “I also serve as an instructor at the Southwest Criminal Justice Training Academy. I am a specialist in firearms and speed measurement (radar and lidar),” said Stinson. On the state-level, Stinson was tapped as a Governor’s appointee to the Commonwealth’s Transportation Board. The Board oversees the state’s transportation policy and budget. His dedication to others does not lessen his attachment and love for his family. He makes time to do the things that are important to his wife and children. He is Assistant Scout Master for Boy Scout Troop 239. The family attends St. Paul Methodist Church in St. Paul, Virginia. He serves as a Lay Leader at the church. At the end of what are often very long days, his wife, Beverly Mullins Stinson, his three children, and German Shephard, are what keep him grounded and motivated in his work. His family’s safety is important to him, so is the safety of the families in this region. Jerry Stinson makes the proper training of police officers in the region his mission. It is also his passion. He’s served in the field, he knows what to do, and he shares that experience and wisdom with those who are tasked to serve and protect. And, to at least one, if not more families in the region, he is a hero in blue. Administration of Justice, Associate of Applied Science degree; Law Enforcement, Certificate; and Crime Scene Technology, Career Studies Certificate. For more information visit the Humanities, Health Technology, Mathematics and Natural/Social Sciences pages.